In 2017 we are witnessing active cryptocurrency industry development. Companies seek to offer their solutions to pressing problems, for example, security establishment and speed of conversion. However, blockchain experts come to the conclusion that there is a question that is not solved yet. We are talking about acquiring. Instead of waiting until the global commercial companies endorse cryptocurrency as a primary payment instrument on a par with fiat, ambitious developers are now offering projects able to change the situation. In October 2017, ICO of the international blockchain acquiring project Cryptonex (CNX) was completed. The team has set up the main objective – to provide the opportunity to exchange any world currencies for crypto currencies and tokens to buy goods and services using mobile phone and payment cards. All transactions will be instantly carried out with minimal commission. Even in the absence of powerful PR-support, Cryptonex team managed to raise 18 million dollars. This result was achieved thanks to the value of the developed product. Taking into account, that every day there appear more than 200 new ICOs, such an impressive amount proves acquiring relevance and actuality for many people. Today for funds deposit/withdrawal implementation, it is necessary to use exchangers or other services (for example, localbitcoins), which charge fees and take much time for conducting operations. There is always risk to lose money because of a dishonest contractor. Money withdrawal is also difficult, and there is no opportunity to pay with cryptocurrency using a mobile application. Cryptocurrency holders are tired of waiting for conversion, deposit and withdrawal and of the fear of losing funds on the exchanges. 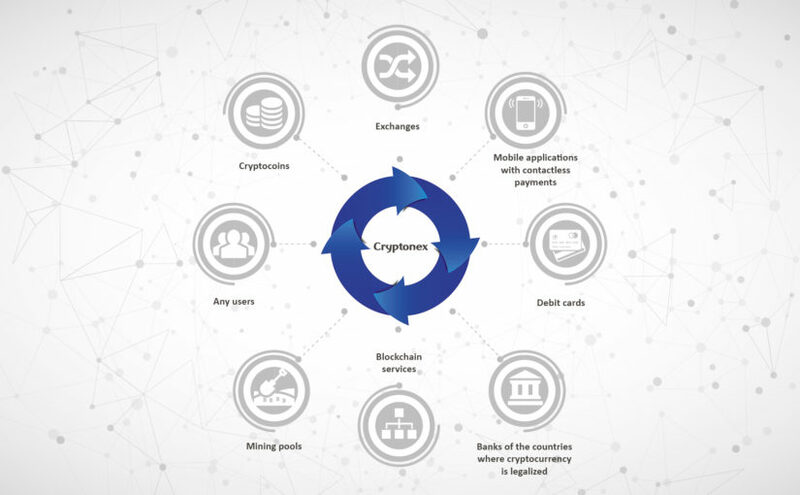 To solve these problems, Cryptonex has already developed a secure web wallet that allows to store and convert popular cryptocurrencies. The team has begun to implement the mobile application and the opportunity to work with fiat. Cryptonex is based on Scrypt encryption algorithm. It protects transactions and wallets from hacking from the outside. The access may be encrypted; the key thing is to store the password in a safe place. Some selected opportunities of Cryptonex are implemented by other cryptocurrencies, in particular, Cryptopay and Dash debit cards. However, there is no full functionality, aggregating all the major financial flows in the blockchain anywhere. In October the process of adding CNX to the exchanges started. Yobit and HitBTC appeared to be the first ones. In comparison with the initial public offering CNX coin value has increased to $2.5. The total amount of the coins issued for trafficking circulation is 105 million CNX. In the nearest plans of Cryptonex is to complete mobile app testing in winter 2018 and start acquiring development. With the Asian investors from the banking sector support, by the end of the year the company will have announced the first deposit/withdrawal operations using mobile app with contactless payments. CNX mandatory participation in acquiring will provide high liquidity and, accordingly, 70-100 times rising cost of the cryptocurrency on exchanges. As an additional income source, the team offers P-o-S mining to the users. The yield is 12% per annum, plus coin price growth. Besides, till the entry into circulation of 90 000 000 CNX, one can participate in the referral program with 20% bonus from coins purchase. Such tools and coin growth prospect together with large-scale financial and technical project support will make some cryptocurrency holders think of their funds redeployments in favor of Cryptonex.